This digital elevation model of Jakobshavn Isbræ was computed from TanDEM-X satellite data. 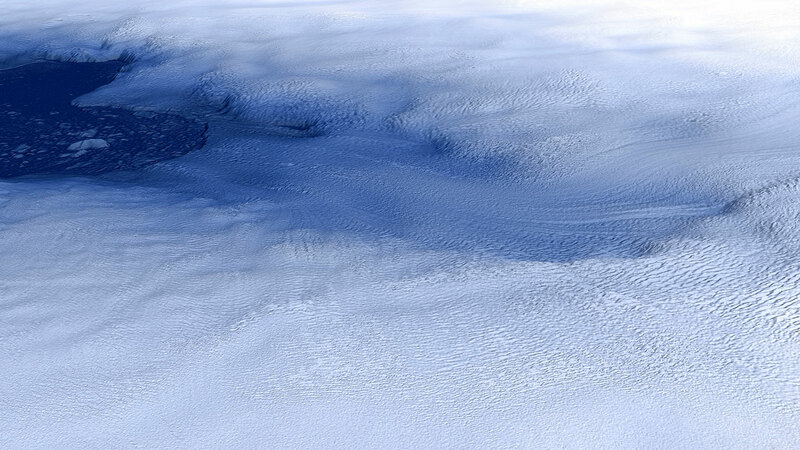 The image shows a detailed 3D view of the complex topography of the glacier front. Icebergs that have broken off of the glacier are transported away in the Ilulissat ice fjord (left). This high-resolution TerraSAR-X image was acquired on 8 January 2014 and shows the glacier front or ‘terminus’ of Jakobshavn Isbræ. The glacier tongue appears as a bright, fractured area, surrounded by the smooth, darker areas along the fjord. In winter, the Ilulissat ice fjord is filled with icebergs that are ‘calved’ from, or broken off of, the glacier front. Since the 1990s, Jakobshavn Isbræ has been regarded as the fastest moving glacier in Greenland. According to studies carried out by researchers from the University of Washington and the German Aerospace Center (Deutsches Zentrum für Luft- und Raumfahrt; DLR), its speed is now increasing dramatically, with record figures for 2012 and 2013. High spatial and temporal resolution data acquired by the German radar satellites TerraSAR-X and TanDEM-X enabled very precise calculations of its speed. The results of the study will be released in the print version of 'The Cryosphere', an international scientific journal of the European Geosciences Union (EGU), on 7 February 2014. "We have been observing Jakobshavn Isbræ with the TerraSAR-X satellite on a regular basis since mid-2008. It is really impressive to see how much this glacier has changed in a very short time," said co-author Dana Floricioiu from the Remote Sensing Technology Institute (Institut für Methodik der Fernerkundung; IMF) of the DLR Earth Observation Center (EOC) in Oberpfaffenhofen. Analysis of the data shows that the annual average of the flow rates for Jakobshavn Isbræ in 2012 and 2013 is almost three times greater than 20 years ago. During the summer period, the flow rates are over four times higher. The maximum speed measured by the scientists in the summer of 2012 was 17 kilometres per year; this is more than 46 metres per day – a record for outflow glaciers not only in Greenland, but also in Antarctica. The glacier's rising speed also indicates an increasing loss of thickness. The volume of Jakobshavn Isbræ entering the ocean is already so considerable that it is affecting sea levels, causing a rise of about one millimetre between 2000 and 2010. In future, the glacier will cause sea levels to rise even further. Satellite data also shows that in the record years of 2012 and 2013, the glacier retreated into the interior one kilometre more than in previous years. According to the experts, in this century alone, the glacier could retreat a further 50 kilometres – to the head of the fjord. Data from TerraSAR-X and TanDEM-X was indispensable to accurately determine the velocity of Jakobshavn Isbræ. DLR's Earth Observation Center provided the satellite data and prepared it specially for this purpose. "We have carefully ensured that the time series of satellite images was not interrupted and the data was delivered reliably. The Earth observation satellites TerraSAR-X and TanDEM-X are wonderful tools because they allow us to observe and study complex ice structures – scientifically exciting fields of study," explains Floricioiu. "Fine structures in ice and snow-covered areas are accurately reproduced in the satellite images. With them, we can analyse dynamic processes such as the flow and movement of glaciers in detail," she adds. TerraSAR-X was initially oriented so that, over several years, it delivered images with a repeat period of eleven days; these always produced a time series with the same imaged area and viewing angle. At the same time, its radar sensor has a very high spatial resolution of three metres. With the data acquired by TerraSAR-X, the research team from the University of Washington was able to track changes in the features of the glacier surface and thus very accurately measure the flow rate. These results were refined in yet a further step; using TanDEM-X radar data, DLR scientists generated 3D digital elevation models of the glacier surface. The rise and fall of the surface was recorded – characteristics that influence the speed of the entire glacier. 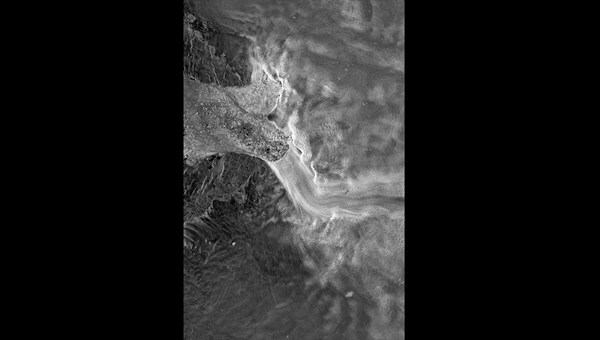 The data acquired by the Earth observation satellites TerraSAR-X and TanDEM-X was therefore crucial to accurately determine the flow rate of Jakobshavn Isbræ. As recent results show, the glacier is in an unstable state; its development, especially with regard to the warming of the polar regions, will therefore continue to be a focus for researchers. TerraSAR-X is being implemented on behalf of the German Aerospace Center DLR with funds from the German Federal Ministry of Economic Affairs and Energy (Bundesministerium für Wirtschaft und Energie). It is the first German satellite manufactured under what is known as a Public-Private Partnership (PPP) between DLR and Airbus Defence and Space. DLR is responsible for using TerraSAR-X data for scientific purposes; it is also responsible for planning and implementing the mission as well as controlling the satellite. Airbus Defence and Space built the satellite, shared the costs of developing it and is sharing the costs of operating it.The programme line 'Geo-Intelligence', part of the 'Communication, Intelligence and Security' business line of Airbus Defence and Space, is responsible for marketing the data commercially. The TanDEM-X mission is financed and implemented as a public-private partnership between the German Aerospace Center DLR and Airbus Defence and Space. Funded by the German Federal Ministry for Economic Affairs and Energy under the ID code 50 EP 0603, TanDEM-X is a Public Private Partnership (PPP) project conducted jointly by DLR and Airbus Defence and Space. DLR is responsible for providing TanDEM-X data to the scientific community, mission planning and implementation, radar operation and calibration, control of the two satellites, and generation of the digital elevation model. To this end, DLR has developed the necessary ground-based facilities. The project's scientific coordination has been entrusted to the DLR Microwaves and Radar Institute in Oberpfaffenhofen. Airbus Defence and Space built the satellite and shares the cost of its development and use. The programme line 'Geo-Intelligence', part of the 'Communication, Intelligence and Security' business line of Airbus Defence and Space is responsible for commercial marketing of the data from both missions, TerraSAR-X and TanDEM-X.